I've been impressed with JaJ's work in the past, but Abandoned is surely my favorite game of his. It is a maze exploration game with a lot more to it than there first appears to be, and while it's not the easiest to get into, it's immensely rewarding. You are thrust into the game with little idea of what is going on. The game's protagonist is a creature who appears to be half-bird, half-machine (or something of the sort). At the beginning of the game, you hatch from an egg in the middle of a hazy, murky maze, and a timer begins ominously counting down. Your goal is, presumably, to escape the maze, with the help of collectible items and skills. really any enemies, the game's challenge lies entirely in figuring things out (and not running out of time, of course). Thus I won't detail the gameplay very specifically. Suffice to say, it consists of solving puzzles, lots of puzzles, with rather minimal hints. Indeed, the game world itself is sort of like one giant puzzle - simply figuring out how the numerous, rather large rooms connect to one another and how to get to that tantalizingly placed item is an enormous challenge in itself. The word that comes to mind is "depth" - it appears simple at first, but gradually becomes more and more dauntingly complex. You're only given a ten minute timer, but the game is much larger than you would expect and it took me many hours to complete (incidentally, if you find yourself wandering around for several minutes with no progress, I advise that you reload and save yourself the frustration of starting over completely). For a game with no reflex challenges whatsoever, it is extremely difficult. The lack of direction sometimes feels excessive, and the time limit plus the size and unnavigability of the world plus the difficulty of the puzzles (a few of them are difficult even to get a conceptual grasp on) can be overwhelming at times. But overall these things work more for the game than against it - in spite of its difficulty, the game is an enthralling experience, and I found myself pressing on long after I expected to quit. The game's mystery and powerful atmosphere work wonders for it, and the lack of explanation and the depth of the puzzles overall are positive aspects of the game, even if they can lead to frustration. Aesthetically, the game is one of the finest I've come across. The graphics are pixellated and dark. They are rough around the edges in an implacable way, but somehow I find that this adds to the foreboding and unsettling atmosphere. They remind me of Soldexus in some ways, though I like them better. The sound design is, simply put, some of the finest I've ever come across in any game. The sound effects are simple retro blips and blops, but the "music" is possibly my single favourite aspect of this game. Not all of it is very tuneful (though some of it is, and very beautifully so at that) but it is as dense with atmosphere as anything I've ever heard, mixing ambient washes of synthesizer and noise and distant, percussive rumblings with music box tinkles. I'd listen to this stuff all by itself in a second. It has an edge of creepiness to it that is perfect, and on the whole it lends and already immersive and fascinating game an even more absorbing and mysterious atmosphere. On the whole, Abandoned is an excellently put together and absorbing game. It suffers at times from the frustrating lack of direction (and the occasional typographical error), but all together it is one of the deepest and most engaging independent games I've played. Recommendations: The 1 people who like Abandoned also like the following games. 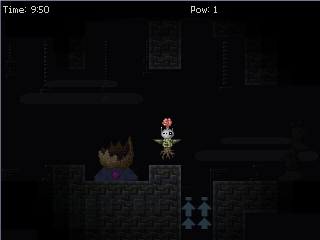 The atmosphere reminds me a lot of Super Metroid (SNES). The gameplay is similar sometimes, also. Does JaJ natively speak a different language? There are spelling errors in almost every one of his games and it really ruins the mood for me sometimes. I'm happy that this game finally got a review posted and will get the attention it deserves, a subtle masterpeice in game design. And as noted below by Trogador. I am responsible for the game's music, under my band moniker, Rachael Please. This isn't better than seiklus, you goddamn idiots. This site is useless. This game certainly has its own atmosphere. It's a pitty that I'm not a puzzler man, else I would have played it all the way through.